Bergen began showing a rebellious side as a teenager at a Swiss school, where she smoked and drank at age 14. She went on to attend the University of Pennsylvania, though she flunked out after just a year. She worked as a Ford model and indulged in her passion for photography, traveling the world with her camera. Her film career began in 1966, when the 19-year-old Bergan portrayed a lesbian college student in the Sidney Lumet film “The Group.” She appeared in several more movies, including “Carnal Knowledge” (1971), in which she starred with Jack Nicholson and Art Garfunkel. In 1975, Bergen made comedic history as the first female host of “Saturday Night Live.” This success at comedy led her to take on the role of the tone-deaf ex-wife of Burt Reynolds’ character in 1979’s “Starting Over.” Her efforts landed an Oscar nomination for Best Supporting Actress. 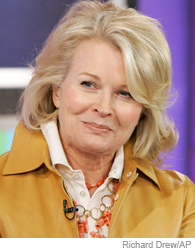 Bergen picked up her best-known role in the late 1980s as the TV journalist Murphy Brown in the CBS sitcom of the same name. The comedy lasted for 10 seasons (1988–1998), during which time Bergen won five Emmys and two Golden Globes. In 1992, Bergen went head to head with Vice President Dan Quayle when he condemned her character’s decision to bear a child alone. In her acceptance speech for her Emmy that same year, Bergen jokingly thanked Quayle for the award. Bergen’s first husband, famed French director Louis Malle, died in 1995, transforming her into a real-life single mom until her 2000 marriage to New York real estate mogul and philanthropist Marshall Rose. More recently, Bergen has taken smaller roles in such films as “Miss Congeniality” (2000) and “Sweet Home Alabama” (2002). She joined the cast of “Boston Legal” in 2005, and earned an Emmy nomination in 2006.